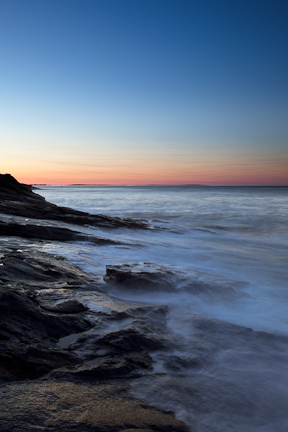 I continue to work through the images I captured at John Paul Caponigro’s Maine Islands workshop. I have plenty to work on! One of the topics for discussion was the use of graduated neutral density filters. With a well captured image the tools available in Lightroom and Photoshop make this type of filter redundant. However, I’m not ready to give up my filters just yet. I will usually take a number of images with and without the filters and see which I like the best. Even with the expensive ‘neutral’ filters from Singh-Ray, under the conditions I usually photograph I get a pronounced color cast. Sometimes I like it, sometimes not so much. The image above was taken without a filter and then processed in photoshop to add a digital neutral density filter. This entry was posted in Photo of the Week and tagged Coast, John Paul Caponigro, Maine, New England, Portfolio, Still Moving, Workshop, Workshops by nixonphoto. Bookmark the permalink. Whatever you did, I like it. I feel as though I am seeing this in a dram and am actually there, in the moment, Andy. Good job.